Peugeot's new 108 - which goes on sale this July - will be priced from £8245 - only £25 more than the entry-level version of the outgoing 107. The 108 is the sister car to the Toyota Aygo and Citroen C1 which will also launch this summer. The new 108 is available in three and five-door bodystyles and there is also a Top! version which gets a retractable roof. 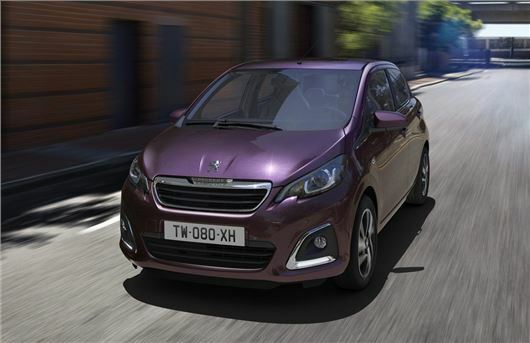 Peugeot is going big on the personalisation side of the 108 with a wide range of colours, contrasting roofs and various trims. There are four trim levels – Access, Active, Allure and Feline. Access is only available on three-door models and comes with LED daytime running lights, remote central locking, USB/aux connection, steering wheel-mounted controls, six airbags, ESP stability control and two rear Isofix mountings. Active models add colour-coded door handles and mirrors, air-conditioning, a height-adjustable driver’s seat, 7-inch touchscreen infotainment system with DAB digital radio, MirrorScreen and Bluetooth. The Allure comes with 15-inch ‘Thorren’ alloy wheels, front fog lights, auto headlights, electric heated door mirrors, reversing camera, leather steering wheel and gear lever, plus keyless entry and start. The top of the range model is the Feline which adds leather upholstery, chrome door handles and automatic dual zone air conditioning. The Top! version with the retractable roof is available in Active and Allure trims. The 108 comes eith a choice of two petrol engines - a 1.0-litre 68PS which emits 95g/km of CO2(88g/km with Stop and Start), or a 1.2-litre PureTech VTi 82PS. A five-speed manual transmission is mated to both engines, with the option of a 2-Tronic semi-automatic gearbox on the 1.0-litre. Prices start at £8,245 on the road for the 108 1.0-litre Access three-door. Active models begin at £9,495, Allure at £10,995 and Feline at £11,845. 108 Top! models are priced from just £10,345 for the 1.0-litre Active three-door rising to £12,245 for the 1.2-litre Allure five-door. how much are the basic citroen and toyota versions of this car?